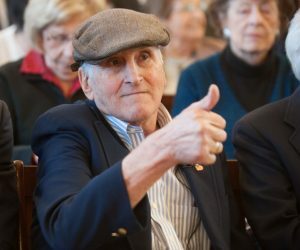 BOSTON — Despite recent funding infusions to provide care for aging Holocaust survivors, the dwindling community’s basic needs will outpace earmarked resources in the years ahead, according to experts. Out of the just under 100,000 Jewish survivors of the Nazi genocide who reside in the US, more than 30,000 live below poverty threshold standards, according to the National Jewish Population Survey (NJPS). And as the survivor community ages, a larger segment will need increased assistance with healthcare and other basic needs. Responding to the dire situation, the Claims Conference announced this month it will commit an additional $500 million toward Holocaust survivors’ home healthcare needs, and lift the cap on funded hours of care per survivor. For Boston-area survivors, new funding will also come from sales of the English translation of Hitler’s “Mein Kampf” manifesto. After decades of controversies tied to its stewardship of the book, Boston-based publisher Houghton Mifflin Harcourt recently decided to direct royalty proceeds from “Mein Kampf” to programs run by Jewish Family & Children Service (JF&CS) for local survivors. Totaling about $60,000 a year, “Mein Kampf” royalties will only cover a modest portion of the survivor community’s needs. Locally, the gap between these needs and available funds has hit up to $150,000 annually, according to Rick Mann, a JF&CS volunteer and chair of the Jewish Community Relations Council’s (JCRC) Holocaust outreach committee. “I had very little idea of the severity of the problem being faced by local survivors until very recently,” Mann told The Times of Israel. “There are hundreds in greater Boston who are in need of essential services,” said Mann, adding that many survivors live under the communal radar. Nearly 300 survivors are served by JF&CS, according to Marsha Frankel, director of elder care services for the Boston agency. About five survivors are added each month, said Frankel, who estimates there are 2,500 in the area. Because some are “fearful of seeking help,” connecting survivors to appropriate services can be challenging — even when there is funding, said Frankel. “We see the will to live and the resilience,” said Frankel of survivors she has worked with for almost two decades. 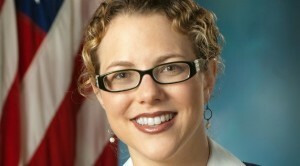 “Many of them face acute chronic medical conditions and poverty,” she said. Labelling the survivors’ needs as “very intense,” Frankel said her agency’s goal is to help them remain at home for as long as possible. This requires access to services ranging from food delivery to transportation, with home healthcare being “a very expensive service to provide,” she said. “If we can help people stay at home, they are feeling safe, with a sense of dignity and respect from the community at large,” Frankel said. 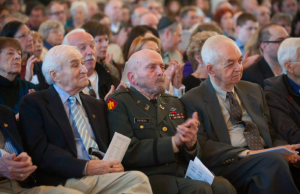 Some people called them “greenhorns,” and not many made efforts to learn about the wartime experience of survivors transplanted to the US, recalled Israel “Izzy” Arbeiter, a survivor of Auschwitz-Birkenau and long-time leader of New England’s survivor community. Born in central Poland’s Plock, Arbeiter’s parents and brother were murdered in the Nazi death camp Treblinka. In 1939 the town’s Jews numbered some 10,000 and made up 26% of the local population; by war’s end only 300 survived. In 1946, Arbeiter married his wife Anna, with whom he had survived a forced labor camp and imprisonment at Auschwitz. Within two years, Anna gave birth to a daughter and the family made their home outside Boston. “We were not very welcomed by the Jewish community after the war,” said Arbeiter in an interview with The Times of Israel. As put by historian Barbara Burstin, “Americans, both men and women, did not understand or appreciate what these ‘greeners’ had been through, and the survivors soon learned, if they had been so inclined, not to talk about their experiences except among themselves,” wrote Burstin about resettlement efforts. Seven decades after what many of them experienced as a frosty reception, thousands of Holocaust survivors again find themselves in need of assistance with their basic needs. “We have a lot more people that are in need now, especially from the [Former Soviet Union],” said Arbeiter. “Home-care is the greatest need, along with food and medicine,” he said. 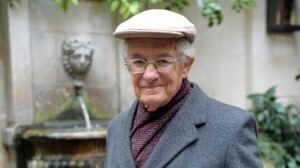 For more than half a century, Arbeiter has advocated on behalf of survivors in the US and countries including Germany, where he received the Merit of Order in 2008 for his work on Jewish-German relations. A volunteer adviser for survivor services at JF&CS, Arbeiter has seen the community’s needs increase as more members reach advanced ages. “There are a lot of survivors who need a little help to be able to finish in a decent way,” said Arbeiter. “We have got to have the tools to help these people,” he added. As put by Mann, “JF&CS has to make a ‘Sophie’s Choice’ on a daily basis as to who gets services,” he said. “The problem is going to increase, not decrease, over the next decade,” he said. In New York City, for instance, up to 30,000 survivors — about half of the community — live in “deprivation, isolation, and poverty,” according to Stuart Eizenstat, special adviser on Holocaust issues to US Secretary of State John Kerry. In an interview with AFP last year, Eizenstat said about one-third of survivors in Israel cope with poverty, and these rates approach 90% in some FSU countries. In the US, the government has started to fund social service grants specifically for aging Holocaust survivors. Some European countries have made reparations available to victims of the Nazis living outside Europe, but these funds are usually one-time infusions, as opposed to sustainable, ongoing support. “There isn’t going to be an opportunity to make this right if we do not act soon,” said Mann. “We will be left feeling the pain of not having helped when our help was needed,” he said. A musical duo of Holocaust survivors from Florida who have toured the United States returned to their native Poland to perform there for the first time, at an outdoor concert in Warsaw. Krakow-born Saul Dreier, 91, and Reuwen Sosnowicz, 89, landed in the Polish capital Thursday to perform next week before some 500 people on Grzybowski Square, which was part of the Warsaw Ghetto. Polish television and radio stations will be broadcasting their concert live to millions of people, according to From the Depths, an organization which does Holocaust commemoration work in Poland. Dreier learned to play the drums in one of three concentration camps he survived. A cantor taught him to play using spoons, he said. Sosnowicz, who was born in Warsaw and for whom this is the first visit to his native country since he left after the Holocaust, has been playing the accordion all his life. He was saved by Polish non-Jews who hid him during the Holocaust and then immigrated to Israel before leaving for the United States. Both he and Dreier lost most of their family members in the Holocaust. 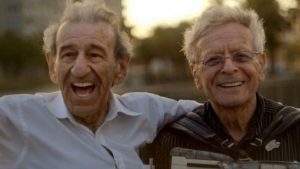 They started their duo, the Holocaust Survivor Klezmer and Multicultural Band, in 2014 and have since performed in Florida, New York and Las Vegas. 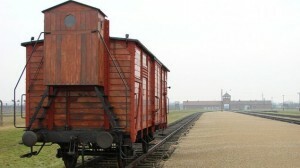 During their visit, Sosnowicz and Dreier are scheduled to visit Auschwitz, the former Nazi death camp in southern Poland, and the former Treblinka camp. They intend to play without an audience not far from the camp in memory of the people killed there. They will also visit the Polish presidential palace, for a meeting with several cabinet ministers. At the Warsaw concert, they will be sharing a stage with Muniek Staszczyk, one of Poland’s best-known rock stars. JTA — For over six decades, Chaim Schwimmer has thrown a kiddush every Simchat Torah, but the reason for this kiddush is not only to celebrate the joyful holiday. The food and the schnapps also mark the anniversary of Schwimmer’s miraculous rescue in 1944 from certain death at Auschwitz. In October that year, the 14-year-old was pulled from a crowd just a few steps from being murdered in the concentration camp’s gas chamber. Schwimmer was one of the approximately 50 young men selected for labor after having been forcibly disrobed and prepared to be marched to their deaths in the faux showers along with hundreds of others. The “Auschwitz 50” were the subject of a 2011 column about Mordechai Eldar, an Israeli hoping to locate others like himself dramatically saved that day, who may have survived the war and perhaps are even living still. Unfortunately, that column proved fruitless. But a guest article elsewhere that mentioned Eldar’s rescue and search for others recently resulted in two emails within a week of each other. My telephone conversation with Isaac Schwimmer then uncovered yet another living person who had survived the selection: Volvish Greenwald, the grandfather of the brother-in-law of Schwimmer’s wife. 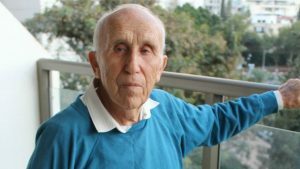 When the initial column appeared in 2011, Eldar, of Herzliya, had already established contact with fellow Israelis David Leitner and Nachum Hoch, and had met Mordechai Linder shortly before Linder died in 2011. And in his email, Ullman mentioned a Manchester, England, resident he had known, Rabbi Yaakov Yosef Weiss, another Auschwitz 50 survivor, who had died in 2013. Each of the three newly found people recently interviewed — Chaim Schwimmer, Herskovic and Greenwald — evinced surprise that Eldar, whom none knew, was searching for them. Each man related personal details of being saved from the Simchat Torah gassing. Chaim Schwimmer, 85, recalled what happened after reaching the gas chamber’s building on that rainy afternoon. “They told us to undress. We were expecting right away that they’d take us to the gas chamber. But we stood — and waited and waited and waited,” he said. Three German soldiers entered the room. One ordered a young prisoner to sprint to the end of the room — apparently, Schwimmer thought, to test his fitness. Schwimmer boasted of his own ability to work. A soldier berated him, but ordered him to leave the building with the others selected. Herskovic, now 88, was unusually calm that day, not dreading what likely awaited. He mumbled a passage from the Talmud on keeping the faith even when a sword was pressed against one’s neck. “I felt that I wouldn’t die, for some reason,” Herskovic said. “When he said that, I knew we’d be saved now. I stood in the second row, and I was immediately picked and sent to the right side, where we were to go back to the camp and remain alive,” Herskovic said. While Greenwald lives four blocks from Chaim Schwimmer, he hasn’t attended the Simchat Torah spreads at the Satmar synagogue on 52nd Street. Schwimmer has thrown the annual kiddush there for 38 years, and before that for 29 years in Montreal, where he first settled after the Holocaust. It’s what’s known as a “seudat hodaya” — a gratitude meal. No announcement is made to proclaim the backstory, but Isaac Schwimmer says that congregants know. They invariably bring children to his grandfather and ask that he relate what happened in 1944. “I’m thankful to God that I’m alive,” Chaim Schwimmer says. “It’s like my family in the widest possible meaning. We walked out alive,” Eldar, 86, said of the fraternity. BERLIN (AFP) — Edgar Feuchtwanger, the son of a prominent German Jewish family with roots in Bavaria going back centuries, vividly remembers nearly bumping into his neighbor Adolf Hitler as a boy. It was 1933 and Hitler, who had just become German chancellor, kept a sprawling flat on Munich’s elegant Prinzregentenplatz next door to Feuchtwanger’s family home. Eight years old at the time, he had been taken by his nanny for a walk when they nearly collided with the country’s most powerful man. “It so happened that just at the moment when we were in front of his door, he came out. He was in a nearly white mackintosh,” Feuchtwanger told AFP. WASHINGTON (AP) — The Obama administration on Wednesday warned several state legislatures against initiatives that would punish the state-owned French railway company SNCF for carrying out Holocaust-era deportations to Nazi death and labor camps. The State Department said such actions would jeopardize recently-begun talks between the United States and France on compensation for SNCF deportation victims and their families. Department spokeswoman Jen Psaki said the United States and France hoped to conclude their discussions as quickly as possible and that initiatives in Maryland and New York threatened a speedy resolution of the talks that began last month. Society as a whole, including much of the organized Jewish community in the United States, has failed to adequately step forward to meet the needs of survivors who go hungry, or are cold. For decades now, the plight of thousands upon thousands of Holocaust survivors throughout the world has been getting worse and worse. 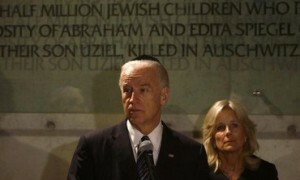 Fully recognizing the moral imperative of not abandoning these victims of Nazi persecution, US Vice President Joe Biden has announced a new multi-pronged initiative of the Obama administration to address the pressing contemporary medical and social needs of the men and women who were mercilessly persecuted by Adolf Hitler’s Third Reich and its accomplices. More than 68 years after Allied troops liberated the German death and concentration camps in which millions of European Jews had been ruthlessly murdered, many of those who miraculously survived live precariously, in dire circumstances. Washington — Aviva Sufian is in “listening mode.” Less than a month after being appointed to serve as the first ever special envoy for U.S. Holocaust survivor services, she is learning the outlines of her new position by speaking to survivors, service providers and not-for-profit organizations, many of them Jewish. “This is the last generation of survivors and, as a survivor shared with me last week, if we don’t help now, we will never be able to,” Sufian told the Forward in an email exchange. “The needs are urgent, and our collective response must be as well.” She noted that a key challenge is creating awareness to the fact that an estimated 120,000 elderly Americans are survivors and that it is believed a quarter of them live in poverty.